This was the very first book written by Jennifer Trafton, an illustrator and elementary school writing teacher. She was unmarried at the time, but has since married A.S. Peterson, as in, the military man who wrote the miracle that is Fiddler’s Green. 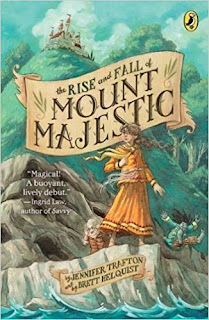 I came into The Rise and Fall of Mount Majestic with no expectations whatsoever. I didn’t even know what it was about. The only reason I got it was because I had become such a huge fan of Jennifer Trafton’s husband. However, the title is one of the best I’ve encountered lately. It has a rhythm if you say it to yourself. And like only the best titles, it immediately had me asking questions. What is Mount Majestic and how does it rise and how does it fall? The answer to that question is so clever, so utterly and fantastically unexpected, I’m not even going to mention it here. You’ll have to discover it for yourself. 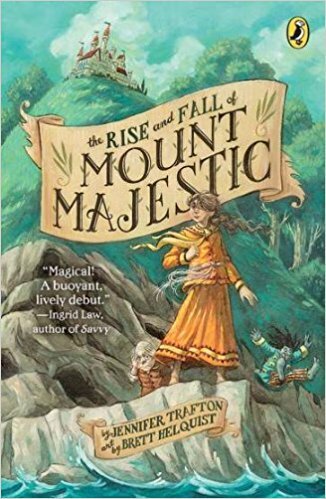 The story centers around a 10-year-old named Persimonny who finds herself lost in the woods and ends up overhearing a plot threatening the entire island. (The story takes place on the Island of the Center of Everything. It is unknown if the island is actually at the center of everything, but its residents do not want to look into it for fear of disproving their claim.) Anyway, this plot involves the mountain—again, the surprise I can’t spoil. But it’s so outrageous, no one will believe Persimonny when she tries to warn them, so it’s up to her and her eccentric friends to stop the plot and save the island themselves. The enormous cast of characters (and their names) are completely absurd, but they manage not to become caricatures. They have real heart and soul and, like all convincing characters, they manage to surprise us. Persimonny is an impulsive and determined little hero. But this is a rare, rare case where I enjoyed the plot as much as, if not more than, the characters. Jennifer Trafton has said that she approaches writing just as she approached playing as a child—not to make any sort of statement, not to crank out wisdom or wit, but to have fun. That shines through here so brilliantly. It’s so ridiculous and fun. I thoroughly enjoyed being here on the Island of the Center of Everything (which may or may not be at the center of everything) amidst the walking trees and the rumplebumbs and the leafeaters and the Poison-Tongued Jumping Tortoises. There was not one moment where I guessed what was going to happen next, and while I didn’t love the ending, the epilogue made up for it. (This book is an example of a prologue and an epilogue done marvelously right.) And then there is the plot twist about the mountain, the part of this book so creative I could have never anticipated it in my entire life. In addition to crafting this weird and colorful world, Jennifer Trafton has complete command over the zanier side of the English language. In an interview, she described writing as trying to squeeze a mountain through the holes of a strainer, or something like that. But there is not a single instance in this book where it was apparent she was trying too hard. She sifts and swirls and bends and invents words at her will and rearranges them in ways I have never seen before. Every sentence snaps and crackles and the dialogue is as quick and fresh as this story’s main character.